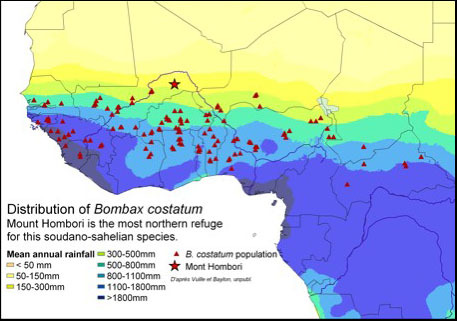 The plateau of Mount Hombori (c. 2km 2 ), with about 150 species, is a hotspot of biodiversity for the Sahel area. For comparison an estimation of about only 200 species can be found in 10'000km 2 in the plains . The representatives of 34 families were found. The Poaceae is of course the main family, followed by the Fabaceae and the Asteraceae. The summit plateau is also an important refuge for species requiring higher rainfall (the rare Gloriosa superba L., Amorphophallus aphyllus (Hook.) Hutch., Bombax costatum Pellegr. et Vuillet), or occurring only on rocky areas ( Enteropogon rupestris (J.A. Schmidt) A. Cheval., Kalanchoe lanceolata Pers., Lannea humilis (Oliv.) Engl.) scattered throughout the Sahel.